contribute to a rapid learning HIV health and social system. A diverse OHTN Review Committee will review and appraise every proposal submitted to the Endgame Funding Program. Review criteria will be included in the application guidelines. To be determined. Please contact funding@ohtn.on.ca if you have any questions. 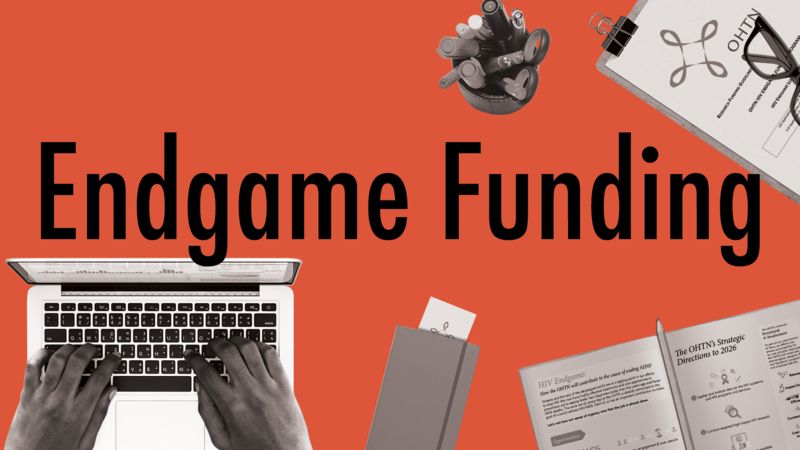 Endgame Leader awards: Salary support for research and community leaders at different stages of their careers who are interested in working with the OHTN to drive change. Community-based Research and Evaluation Awards: project funding for community based agencies and people living with HIV to undertake research and evaluation that will have a meaningful impact on services for those most affected by HIV. Emerging Issues Awards: targeted calls for research in urgent or emerging issues where OHTN, in consultation with its stakeholders, have identified clear knowledge gaps. Salary support for research and community leaders at different stages of their careers who are interested in working with the OHTN to drive change. Focus: A comprehensive program of research and knowledge transfer to improve the HIV prevention and care cascade working with a defined population. Focus:Researcher’s work will focus on studies to fill prevention and/or care knowledge gaps and/or evaluate interventions to improve programs and services. Focus: Research should address gaps identified by frontline service providers and work to better define these challenges, or identify solutions. Eligibility criteria: Principal applicant resides in Ontario and project will be carried out in Ontario. Use peer support or peer navigation to help people living with HIV have better outcomes along the HIV treatment cascade. Preference will be given to projects where community and clinicians work together. Reduce barriers to early access to HIV care and prevention for people who use drugs including (but not restricted to) making better use of supervised injection sites. Deliver mental health services to people living with HIV in innovative, non-traditional ways (telephone, internet, mobile health units, etc.) or that use mixed public/private billing models to make mental health more accessible to all. Enhance sexual health literacy and/or access to care for a specifically defined population.